A good network is the basis for mutual success. Music of Vienna is always on the lookout to extend its network by connecting with other companies and websites that are of interest to our customers and fans of classical music in general. Most of these areas will at least be available in English and German. You may then choose whether your link appears on the english or german language version. By rule of thumb we only link to english sites from the english pages and german sites or pages from the german pages. A description of the type of link you desire (Banner, Text, title, alt). Enjoy classical music in Vienna at its finest: magnificent concert halls, authentic costumes and selected orchestras - buy your tickets online today. <a href="https://www.musicofvienna.com/" title="Classical music of Vienna - purchase concert tickets online">Classical Music Vienna</a><br>Enjoy classical music in Vienna at its finest: magnificent concert halls, authentic costumes and selected orchestras - buy your tickets online today. Enjoy classical concerts in Vienna at their finest: magnificent concert halls, authentic costumes and selected orchestras - buy your tickets online today. 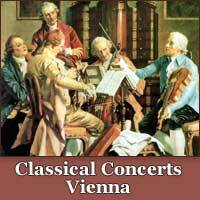 <a href="https://www.musicofvienna.com/classical-concerts-vienna.htm" title="Classical concerts Vienna - order concert tickets online">Classical concerts Vienna</a><br>Enjoy classical concerts in Vienna at their finest: magnificent concert halls, authentic costumes and selected orchestras - buy your tickets online today. Select a banner that fits into the design of your website. Please save the image to your web-server (right-click and select "Save as ...") and adjust the parameter for src="" accordingly.